James Rhyne Killian, 1904-1988, S.B. in management, 1926, Massachusetts Institute of Technology, remained at MIT as assistant managing editor, then managing editor, of Technology Review, the magazine of the Alumni Association; he was editor from 1930 to 1939, and helped found the Technology Press, now the MIT Press. In 1939 he became executive assistant to MIT President Karl Taylor Compton. 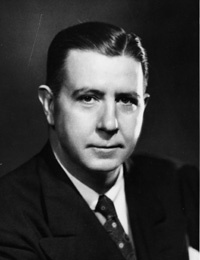 During World War II, when Compton was involved with the National Defense Research Committee, Killian acted as Compton’s surrogate in directing the operation of MIT, which was also heavily involved in wartime research and development. He was appointed executive vice president in 1943, and vice president and member of the MIT Corporation in 1945. He became the tenth president of MIT in 1948 and served until 1959; he was then chairman of the MIT Corporation, 1959-1971. As special assistant for science and technology to President Dwight D. Eisenhower, 1957-1959, Killian formed the President’s Science Advisory Committee (PSAC) which was instrumental in initiating national curriculum reforms in science and technology and in establishing the National Aeronautics and Space Administration (NASA). He participated in many other government advisory and study groups including President Harry S. Truman’s Communications Policy Board, 1950-1951; the President’s Advisory Committee on Management, 1950-1952; the Board of Visitors of the U.S. Naval Academy, 1953-1955; the Army Scientific Advisory Panel (chairman), 1951-1956; and the President’s Foreign Intelligence Advisory Board, 1961-1963. He was chairman of the Carnegie Commission on Educational Television, 1965-1967, which led to the “Public Television Act of 1967”; he then served as director of the Corporation for Public Broadcasting, 1968-1974. He was a member of the General Advisory Committee of the U.S. Arms Control and Disarmament Agency, 1969-1974. Among his books are Sputnik, Scientists and Eisenhower (1977); Flash! Seeing the Unseen by Ultra-High Speed Photography, with Harold E. Edgerton (1939, 1954); and The Education of a College President (1985).